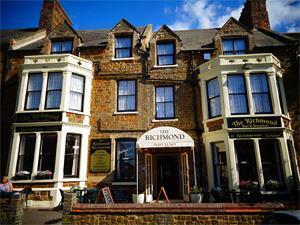 The Richmond B&B & Restaurant01485 532601work Bed & BreakfastA large Victorian property close to all amenities and ninety yards from the sea front. The property offers en-suite rooms, five on the ground floor, all with tea making facilities and full central heating. There are lift facilities to the first floor rooms. There is a fully stocked bar and a restaurant open to residents and non-residents. The premises is proprietor run. A large Victorian property close to all amenities and ninety yards from the sea front. The property offers en-suite rooms, five on the ground floor, all with tea making facilities and full central heating. There are lift facilities to the first floor rooms. There is a fully stocked bar and a restaurant open to residents and non-residents. The premises is proprietor run. Special rates: Senior citizen 3 day (plus) breaks April, May, June and Oct (exc Bank Holidays). Second left on Roundabout as you approach Hunstanton, right on next R/about. First junction turn right, 3rd property on right.